Marketing technology is increasingly dominating the industry. Software platforms like customer relationship management (CRM) and email marketing systems are important mechanisms to ensure that you reach your audience at once with a branded and personalized message. Increasingly, these marketing technology solutions are becoming integrated into brand websites for a more seamless user experience. HubSpot, for example, offers tools to build landing pages with sign up forms that kick off workflows and nurturing email chains, completing the inbound marketing experience. Technically, integrations like the HubSpot example above are possible regardless of the website backend and CMS you use. 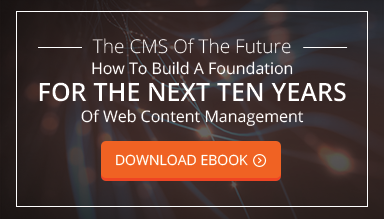 But in reality, you should stay far away from a template-based system, and go with a custom CMS instead for any complex third party integration. Here are 3 reasons that's the case. Any custom integration on a template-based CMS like WordPress requires workarounds to function. Often, you have to involve a plugin that is often not connected directly to the marketing technology platform you are looking to integrate. Particularly if that platform is based on its own application program interface (API), the result can become messy. A custom CMS, on the other hand, can be built specifically with your desired integrations in mind. If for example, you use Marketo for your marketing automation needs, or Salesforce as your CRM, you can build a CMS that incorporates that software's features and capabilities into your backend and website. The result is a single, unified system that is much more likely to work than its alternative. Many of the plugins available to integrate a third-party API with your template CMS are not created by the creators of that API. So when something goes wrong, and you are looking for help on how to fix it, you may not know where to turn. The plugin creator may be looking to help you in order to maximize the success of their product, but because they are not directly involved with either the CMS or the API, their helpfulness will be significantly limited. On the other hand, using a custom CMS as the basis for your integration means that you can get reliable help that applies specifically to your website. The CMS developer will be able to help you ensure a successful integration, while the API provider has more freedom and the ability to direct you and the developer on the steps you need to take to succeed. The above point is especially important because of the degree at which third party integrations with template-based CMS systems fail. For evidence, look no further than the reviews for this ConstantContact plugin, aiming to integrate the popular email software into your website. One-star reviews dominate, with users reporting issues from random error messages to a complete lack of access to the API. If you use a marketing technology platform or another type of third party tool to optimize your website, chances are you need it to work - and work reliably. When you try an integration on a template-based CMS, that simply won't be possible. A custom CMS, on the other hand, allows you to more easily integrate the tool into your website and its backend.